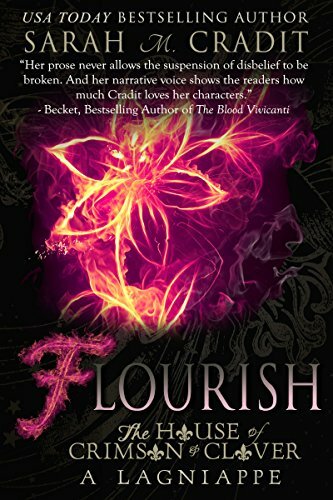 Flourish: The Story of Anne Fontaine a novelette, is a La Famille Lagniappe in the House of Crimson & Clover Series. It can be enjoyed as a standalone story, or as a companion to to the series. Following the death of her dominating mother, Anne Fontaine decides to leave the bayou to reconnect with her estranged half-sister, Adrienne Deschanel. Her hope is to forge a relationship with Adrienne that was not possible when her mother was alive. Secretly, she also hopes to find out if her extraordinary supernatural talents are shared by anyone else. When Nicolas Deschanel gets wind of Anne’s presence, he suspects that she is one of many con artists after his sister’s money. Not knowing her story is true, he engages her in a game of cat-and-mouse, deciding to have some fun. Eventually, circumstances find both of them back at the Deschanel family seat, Ophélie, where secrets and stories come to life.